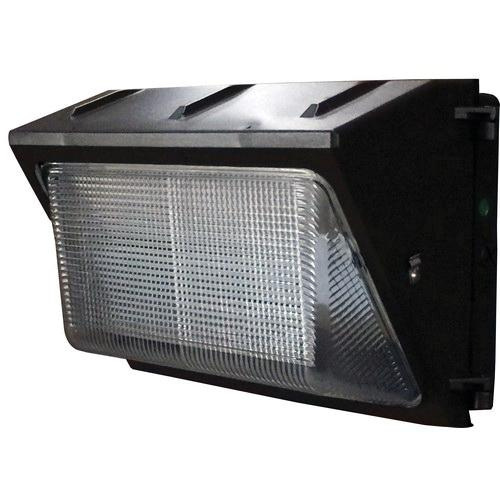 Morris 70 LED Medium wallpack has input voltage rating of 100 - 277-Volt AC and output voltage rating of 25.2 - 42-Volt DC. It has input current rating of 0.52-Amps and output current rating of 1.2-Amps. This 59-Watt LED lamp has color rendering index of greater than 83, color temperature of 5098K and delivers brightness of 5400 Lumens. It features die-cast aluminum housing. It supports wall mounting. Wallpack measures 360.5 mm x 187.7 mm x 235 mm. High-impact heat resistant borosilicate glass offers complete protection to LEDs. This IP54 rated dust and water-tight wallpack has four threaded apertures one at top, one at back and two at sides. Wallpack is suitable to use in general lighting applications such as parking lots and building security. Wallpack is cULus listed and meets DLC requirements.